Introducing the COLORCUBE: 3D Color Puzzle! COLORCUBE: 3D Color Puzzle - $29.99USD + shipping. A super puzzle that is part construction toy, part teaching tool! Build a color matrix in three dimensions and learn about the many relationships of color. Over a billion possible combinations, but only one true harmonious solution, COLORCUBE is a puzzler's dream (or nightmare!) Suitable for ages 10-110. 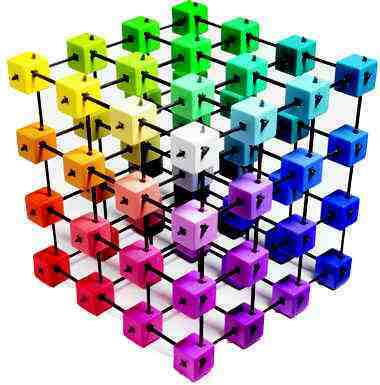 128 colored pieces - match the color pairs and construct 64 - 1" cubes; all made from high quality polystryrene plastic. 48 connecting rods - reinforced nylon rods (approx. 9" in length); each holds 4 cubes. Instructional poster - 12 steps to understand digital color and the logic behind the COLORCUBE model. Here is a preview of the puzzle assembly. These hints will not interfere with the challenge and fun of figuring out the 3-dimensional order of the 64 colors. 1. Click the cubes together - for each half there is only one other perfect color half. 2. Attach the cubes to the rods, which use a "turn and click" mechanism. 3. Place the colors in the most harmonious order. Suitable for ages 10 to 110. Made in Canada.